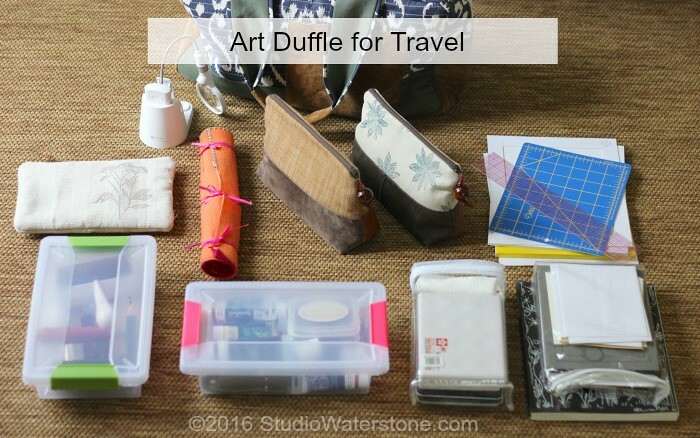 In the recent Artful Blogging article, I discussed my new practice of keeping an art duffle on hand both at home and for traveling. Of course, I'm not talking about carrying supplies on busy vacations or short trips - in that case, I just toss what I need into my backpack and head out. This is for taming the art supply beast when at home or I'm heading away for a week and I want my favorite things available for playing. 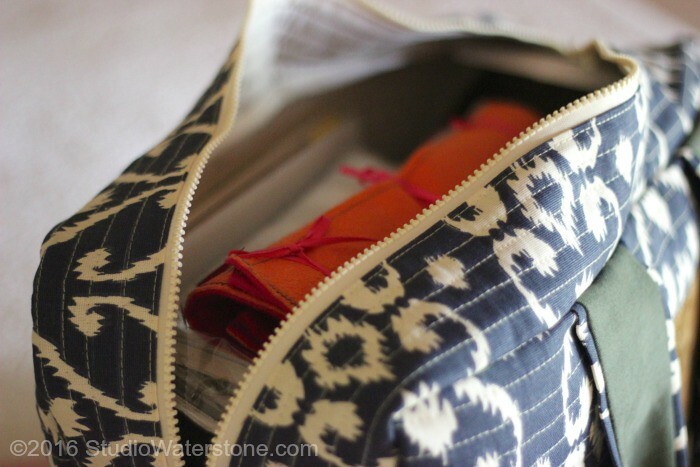 This simple solution has been a life saver - my duffle is organized nearby at home and always ready for extended trips. 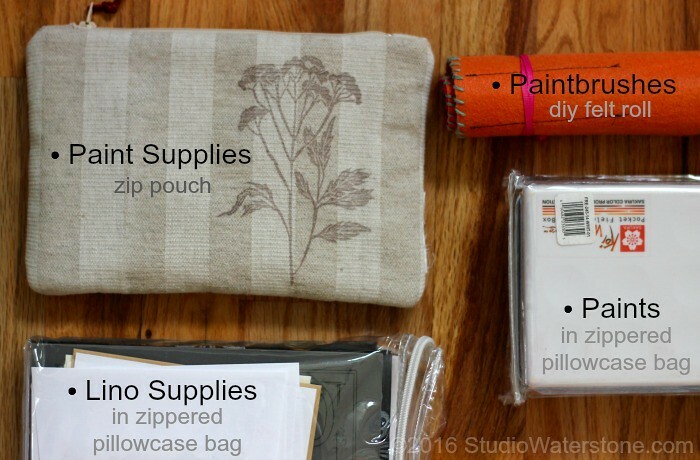 For paint supplies, I use one of my own simple zip pouches. To this day, I still use my original paintbrush roll. 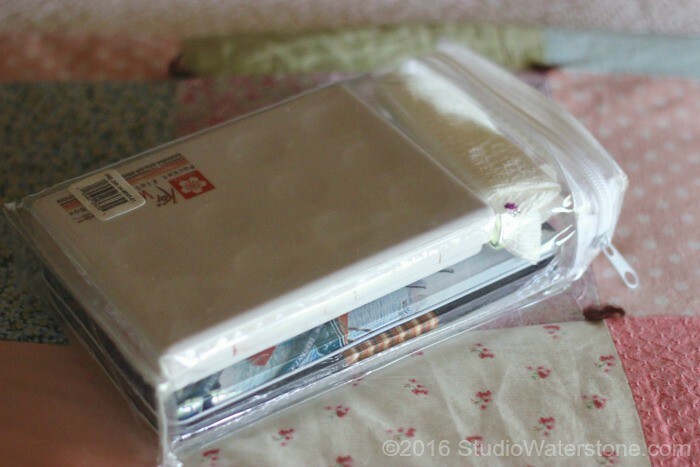 paint case, my tins of watercolor & pastel pencils go in saved pillowcase zip pouches (see below). You know the little plastic zip pouches that hold new pillowcases? Don't throw those away!! They're ideal for travel and storage. 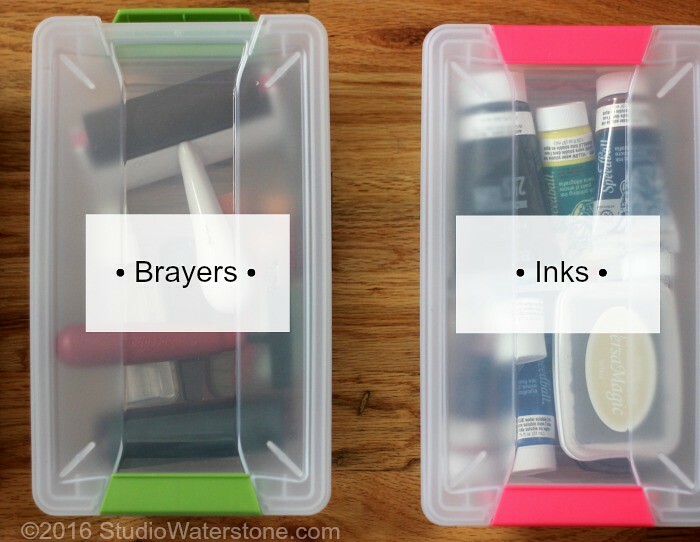 Small plastic containers for more bulky items like brayers and ink. Carving tools go in my large artist's pouch. 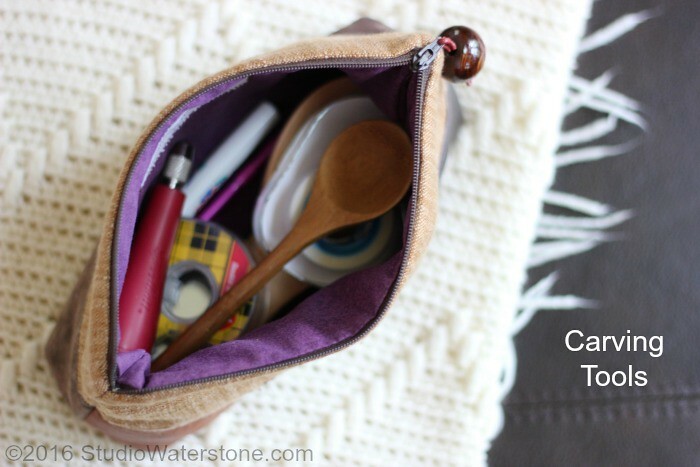 Pens and pencils in another large artist's pouch. • I carry this small Ott light for carving, a small see through ruler, and small cutting board. 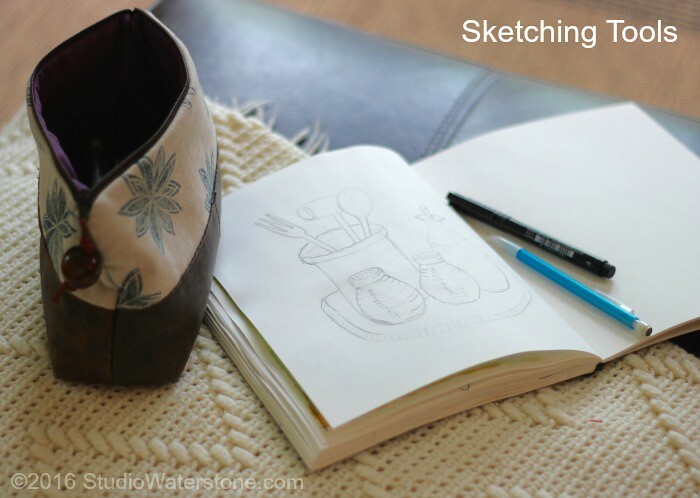 • My sketchbook, paper-sized registration boards, and portable palette fit snugly and safely placed vertically on the side. It's a ton of stuff, right? But it works! 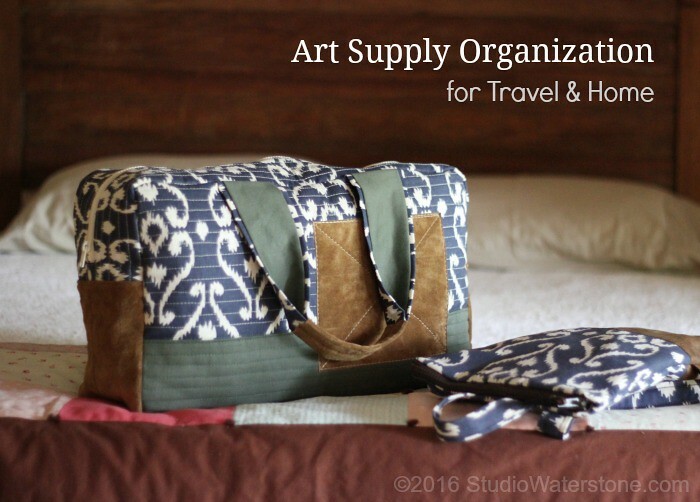 I'd love to hear about your method for organizing and carrying supplies. 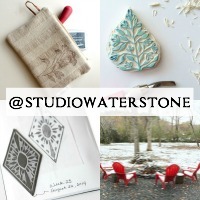 A beautiful, practical and compact way to store and carry an enticing variety of art tools and supplies! Thanks, Karen. And it works, too! Oh my goodness, all of that fits in this bag??? Truly, you are so organized, and I just love this bag, especially since you can put so much in it. Wishing you a wonderful week ahead Lori!